Jon McNaughton has been painting for over 25 years. His growing concern for America had been building when the idea for the painting came to him “in a bold way.” He knew it would take more time and research than he had ever consumed on one of his paintings. But he realized that the painting he entitled “One Nation Under God” was worth the diligent artistry. McNaughton’s painting is just one interpretation of America past and present, but it has left his audiences stunned with the magnitude of details and the eclectic representations of Americans. 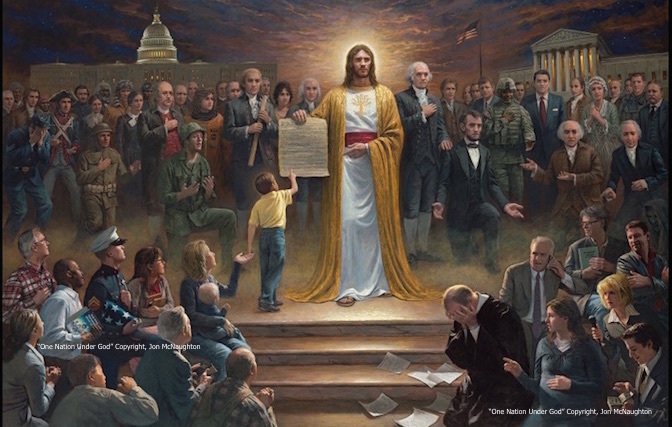 For example, you can see the founding fathers and the patriots that believed for and fought for America in the painting’s upper left and right side behind the brilliant image of Christ holding the American Constitution. These men and women were passionately religious. And saw the hand of God all around them. To God they gave thanks for His hand and the founding of this great nation. To Him, according to their own testimony, they turned for wisdom and strength when life and liberty hung in the balance…This painting, “One Nation Under God,” is my personal witness and reminder of those who went before us — that they knew from whence their blessings came. On McNaughton’s fine art website, he has a page dedicated solely to this painting. It is set up as an interactive page that explains “some of the points of confusion for those who wish to interpret” his painting. McNaughton almost prophesies in his painting about the changing of hearts of abortion-minded women. What causes this change? Often, it’s the value of every life and the evident love of mothers who have gone before them. The artist is depicting the overwhelming shift of women changing their minds about the “choice” of abortion. And he is displaying this conversion as hope. To see more of this painting and other works by Jon McNaughton, or to purchase “One Nation Under God,” you can visit his website here.